D.W. Leitner tries out the Aaton Penelope with 4K Penelope Delta digital cinema back, in place of usual 35mm magazine. D.W. Leitner phones it in each day with the latest info on technology at NAB 2010 in an audio podcast directly from the Las Vegas convention center. This updated posting includes all three sections of his review. 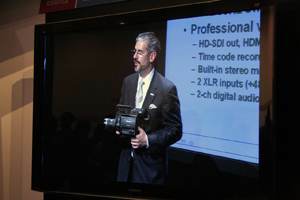 Panasonic rep shows the company’s single large CMOS camcorder due to ship later this year. Director, producer, journalist David Walker Leitner has reported on the film and video production and post industries for over 20 years. 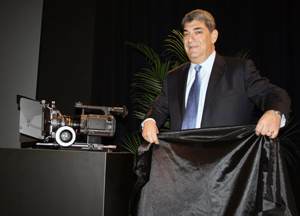 Sony’s large single sensor camcorder will be out by “next NAB” according to David’s report. This is actually just the first part of Day One, covering what Sony, Panasonic, Canon, and Aaton announced during Sunday’s press conferences. There’s much more to talk about in each of these postings, so be sure to come back to get the full scope of David’s 20+ years of NAB sleuthing. For the second part of David’s podcast, covering Sunday, the first day of NAB 2010, we pick up the conversation on a real find: the innovative Aaton Penelope with 4K Penelope Delta digital cinema back. David also touches on the market for large sensor camcorders, and more on all the intense push behind 3D production at the show. Approximately 12 ½ minutes. For the final section of David’s take on the first day of NAB 2010, he touches on what seems to be behind the thinking that 3D production is the next step for theatrical and other screens, why we don’t see a surge of consumer 3D camcorders, and how marketing types fall down in selling technology they’ve never used. Approximately 6 ½ minutes.